I came across a very interesting couponing website other day. Never have I seen a coupon site with an interesting web layout. Alas! Shop Pirate is an amazing couponing website which lets you loot discounts! 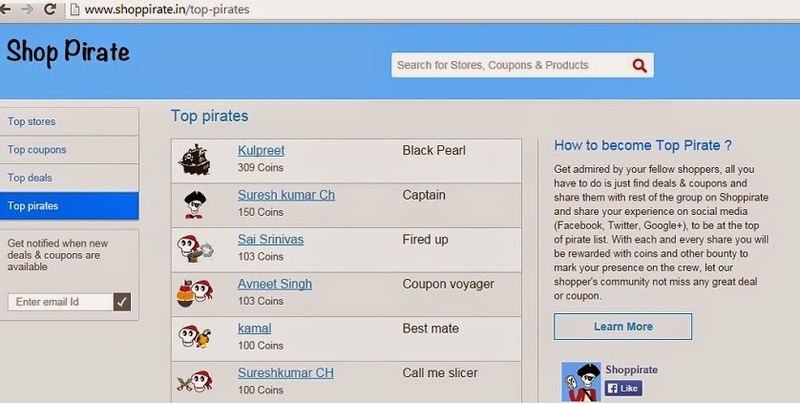 I am constantly searching for coupons to get better deals on branded products until today I had never found any website which made couponing a fun activity like Shop pirate has! I am impressed with the attention to detail and innovative way to make couponing fun! You can also become a Top Pirate on the website. All you have to do is just find deals and coupons and share them with the rest of the group on Shop Pirate. You are also required to share your experience on social media (Facebook, Twitter, Google+), to be at the top of pirate list. With each and every share you will be rewarded with coins and other bounty to mark your presence on the crew. Share more to get a chance to loot more bounty and discounts! You can also find plethora of beauty and wellness coupons at Shop Pirate. I am really glad the website has aseparate section for wellness product. Considering the fact it is considered a taboo to talk about it in India, it is great to see websites not shying away. Don't forget to check out Shop Pirate Coupons , your one stop Pirate pit shop to loot discount coupons!